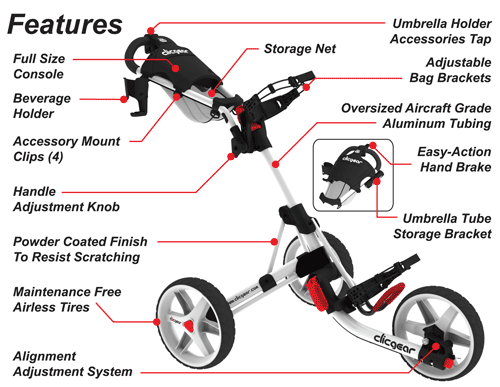 A golf push cart that stands out among the crowded market today must have features that are unique from the rest. If you find a cart having either all or almost all of the features named below, then that’s a kill. Go for it! As far as size is always concerned, the smaller your golf push cart, especially when folded, the better it will be. There is nothing in life that is as important as convenience. You always want whatever you possess to boost on your convenience as much as possible. You don’t want to have a golf cart that is convenient while on the course but stresses you up when you want to load it on to your car for transportation. Your golf cart must just fit in the trunk of your car together with the other accessories that you brought to the course such as the clubs etc. One of the things that will stress you up in the golf course is opening up the cart. It may be easy to fold it up but tricky to open it up. If there is such a cart, it is not the right product for you. The best units are always easy to operate especially to open when you arrive in the course. You don’t need to look for the instruction book so that you can fold and unfold a good cart. Remember convenience is a virtue in this game. A good golf cart has to be easily adjustable to allow for natural posture and handling. The handles have to be flexible and adjustable to allow the user to have control over the cart regardless of their height. If a cart lacks this feature, it may not be the best for you. No one plays golf without drinking water regularly in between shots? Water is a necessity in life and more so in any form of sport. The most appropriate cart for you is that which gives you the provision of placing your water and other beverages in position. There are some carts that have up to three cup holders for three different beverages. The baseline is that you have at least one of these holders. This feature brings us back to the convenience subject. Efficiency is an important aspect that determines the maneuverability of a cart. If a cart doesn’t maneuver easily, then it implies that you will be using more energy on the cart than on shots. Look for that cart that can easily be maneuvered in the course and save that extra energy for swings. These are designed to hold the bad from swinging or falling. The best golf push cart for you must always have such straps. Two is a good number. This is only achieved if your cart has got wide wheels that are widely spaced apart. The cart also needs to be as low as possible. A cart that will keep on falling after a very slight topple-force being applied is outdated and not fit for you. A cart that has been undergoing constant improvement is a cart worth being purchased. Improvement of a given unit is an indication that the manufacture always listens to the complaints and the concerns of the customers. They then take the bold step of improving a given unit. A New Golf Push Cart or A Used One: Which One Do I Go For?